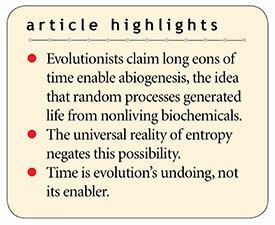 Evolutionists use a variety of imaginative analogies to make the spontaneous generation of life seem plausible. One of the more familiar is the typing monkeys scenario, also known as the infinite monkey theorem. It proposes that hordes of monkeys, randomly typing on typewriters with unlimited supplies of ink, time, and paper, can eventually produce a work of Shakespeare. However, some people insist that even ridiculously small improbabilities are ultimately achievable. With infinite time, they say, any interrelated series of “lucky” coincidences can occur. Time plus entropy prevents the spontaneous generation of life and any hope of evolution. Is infinite time the ultimate “rescuing device” for evolution’s improbabilities? Evolutionists say yes, worshipping unlimited time itself as a “hero” (a Creator substitute, actually) that somehow carries the irrationally improbable into the realm of the possible. But is literally anything possible in our universe given mere molecules-in-motion and infinite time? As applied to life’s origins, the answer is absolutely no, for many reasons. One such reason is entropy—the Second Law of Thermodynamics—which is the universal tendency in the real world toward a decrease in order and complexity. Entropy won’t go away, no matter how desperately evolutionary imaginations wish it to! Our universe is always governed by entropy, and the biochemical compounds needed for life, such as DNA, RNA, amino acids, lipoproteins, glycoproteins, etc., are no exception. Thermodynamically speaking, all of the basic biochemical building blocks needed to construct body parts for humans and animals are inherently and inescapably unstable. Thus, any accidental (random, lucky, undesigned) assembly of biochemicals in a so-called “primordial soup” would be statistically likely to disintegrate with every passing moment. That means any accidental bio-assemblage would be ephemeral at best. Entropy ensures that infinite time is the destroyer of accidental biomolecules, not a “savior” that preserves and then builds them from simple to complex. As Dr. A. E. Wilder-Smith once clarified, the typing monkeys scenario is a false analogy.4 Forgetting that the monkeys will die of hunger, and ignoring the problem of sourcing unlimited paper, and omitting the inevitability of typewriter keys being ground to powder long before anything that appears intelligent can be accidently typed—the typewriters themselves must use “biochemical entropy ink,” an ink destined to disappear over time. Specifically, whenever “evolutionary typewriter” keys strike paper, the ink (representing any inherently unstable organic compound) deposited will continuously tend to disintegrate. In other words, the ink used at every split second thereafter is likely to disappear off the page. Consequently, any lucky Shakespearean words or phrases will not survive for any meaningful time! Getting to the real truth about origins requires opening and reading the pages of Genesis. Thus, eons of time guarantee that the simian keypunchers can never type out Hamlet—the imagined luck is “not to be.” Time plus entropy prevents the spontaneous generation of life and any hope of evolution. Getting to the real truth about origins requires opening and reading the pages of Genesis. Morris III, H. 2013. Willingly Ignorant. Acts & Facts. 42 (3): 5-7, illustrating 2 Peter 3:5. Gish, D. 1976. The Origin of Life: Theories on the Origin of Biological Order. Acts & Facts. 5 (7). See also Tomkins, J. P. 2018. The Impossibility of Life’s Evolutionary Beginnings. Acts & Facts. 47 (3): 11-14; Morris, H. M. 1973. Evolution, Thermodynamics, and Entropy. Acts & Facts. 2 (3); McCombs, C. 2004. Evolution Hopes You Don’t Know Chemistry: The Problem of Control. Acts & Facts. 33 (8); Thomas, B. Critique of ‘Primordial Soup’ Vindicates Creation Research. Creation Science Update. Posted on ICR.org February 11, 2010. Morris, H. M. 2002. The Mystery of Complexity. Acts & Facts. 31 (1). When I was a doctoral student at the University of North Carolina in the early 1980s, Dr. Wilder-Smith discussed this topic during a Q&A session at an apologetics event there. See also Wilder-Smith, A. E. 1993. The Origin of Conceptual Thought in Living Systems. Acts & Facts. 22 (2). Cite this article: James J. S. Johnson, J.D., Th.D. 2018. Infinite Time Won't Rescue Evolution. Acts & Facts. 47 (6).